This beautiful 24-hour clock, with divisions marked in Roman numerals, may be found at the Greenwich Observatory, near London. 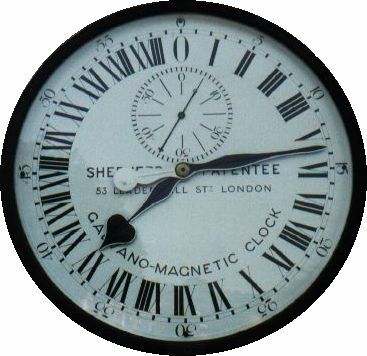 In the middle of Queen Victoria's reign, in August 1852, Charles Shepherd built and installed his Galvano-Magnetic clock (sometimes referred to as an electric-motor-clock) at the Observatory. Known also as the Master Clock, this timepiece brought into existence that now-common concept of coördinated time. The dials and time balls in Greenwich and London were synchronized via telegraph to Greenwich Mean Time, as were clocks throughout the rail system. The Astronomer Royal has erected Shepherd's Electro-Magnetic Clock at the Royal Observatory, for the transmission of Greenwich Mean Time to distant places. On and after November 1st, the needle of your Instrument will move to make the letter N precisely at . . o'clock every day. You are at liberty to allow local Clock and Watch Makers to have Greenwich time, providing such liberty shall not interfere with the Company's service and the essential privacy of Telegraph Offices, and the business connected there with. As part of The Queen's Golden Jubilee String of Pearl Programme the clock is being renovated to mark its 150th anniversary. The original plans will be used to guide the restoration, and the Master Clock is scheduled to be fully operational by August 2002.